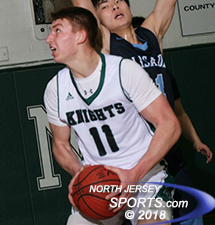 Ryan Picinic missed two free throws at the end of regulation, but then made four straight in overtime of a 71-66 win over Pal Park in the opening round of the North 1, Group 1 state sectional title. NEW MILFORD –While all players go through emotions over the course of a do-or-die state game, it would be tough to match stories with New Milford senior Ryan Picinic experienced over the course of 37 minutes of action in the opening round of the North 1, Group 1 state sectional tournament on Monday night. Picinic went from the lowest of lows to the highest of highs all in a few short minutes. After coming up short with a chance to beat pesky Palisades Park in regulation Picinic made the most of a second opportunity in overtime. After his team battled all the way back from a 13-point deficit in the fourth quarter, Picinic missed two free throws with the score tied and no time remaining in regulation. The teams headed for overtime where Picinic made up for those misses by nailing all four of his free throws in the final 42 seconds as seventh-seeded New Milford won a wild one, 71-66, over the No. 10 Palisades Park on Monday night at New Milford High School. “This was a crazy game and it was pretty frustrating at times, but we grinded our way out of it,” said New Milford two-sport standout Matt McElroy, who recently committed to play football at the University of Pennsylvania. The highs and lows for Picinic started right from the game’s opening minutes. The 6-foot-5 senior scored three straight buckets inside to give the Knights a quick 6-0 lead. Pal Park answered with a run led by speedy sophomore point guard Chris Rodriguez. 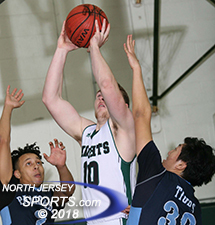 He netted eight points in a 10-0 run the put the Tigers in front before New Milford evened the score at the end of one quarter. Pal Park sophomore point guard Chris Rodriguez finished with 31 points, five steals, three rebounds and three assists. Freshman forward Derrick Bueno had a solid game off the bench for Pal Park. On two straight possessions to start the second quarter Bueno converted three-point plays then scored a tough layup to make it a five-point lead that the Tigers maintained going into the second half, 30-25. Rodriguez had control of the ball throughout the game and made plays whenever it looked like New Milford might make a run. The Pal Park lead was seven early in the fourth quarter when Bueno clicked on another three-point play and Rodriguez followed with a steal and a driving layup to push the lead up to double-digits. The advantage grew to 13 on a three-pointer by Pal Park guard Ben Zlatkin near the midway point of the fourth quarter. It looked to be lights out, season over for the Knights. But on the ensuing possession Bueno picked up his fifth foul with 4:02 to play to set in motion a whacky ending to regulation. The Tigers opened the door to the comeback by missing nine consecutive free throws in the final 2-plus minutes. New Milford did not help its own cause by missing its share of foul shots, but made enough of them to get within striking distance on Picinic’s free throw with just over a minute to play. After two more missed free throws by the Tigers, McElroy, the bruising senior forward, converted a putback of his own miss to make it a one-possession game, 59-57. The Knights gained possession again and made the most of it in the final seconds. Tyler Picinic, who had not scored to that point, hit a tough floater just inside the elbow to tie the game with 11 seconds left. As the crowd was whipped into a frenzy in the final four minutes the game went from interesting to wild to weird and everything in between. Pal Park quickly raced down court but turned the ball over to give the Knights one last opportunity to win it in regulation. The Knights advanced it quickly to Ryan Picinic, who drove to the basket and got fouled with no time left on the clock. 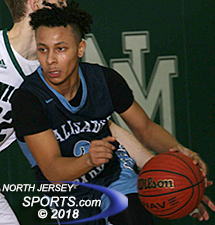 He needed to make just one of two free throws for the win, but missed his first one when Palisades Park head coach Jon Wiseman called a timeout. The senior stepped to the line following the stoppage confident that he would make the second, only to watch helplessly as it glanced off the rim and the teams needed overtime to decide which season continued and which was over. McElroy scored on a contested drive to the basket and Tyler Picinic hit a long jumper from the wing. Twice the Tigers made it a one-point game inside the final minute when Ryan Picinic got fouled and went to the line. This time he nailed both from the line and added two more made free throws in the clutch. Pal Park had a tying three-point attempt in the closing seconds but it was off the mark and McElroy iced the game from the charity stripe with a second left. McElroy scored half of his game-high and career-high 32 points in the fourth quarter and in overtime for New Milford (17-8). Ryan Picinic added 21 points and led all players with 14 rebounds. Rodriguez finished with 31 points, five steals, three rebounds and three assists. Bueno added his best overall performance of the season with 18 points, 11 rebounds, and five blocks for Palisades Park, which finished the season with a 10-13 record. After mounting a monster comeback to advance, New Milford will move on to face No. 2 seed Bogota, a 68-50 winner over Wood-Ridge, in the North 1, Group 1 quarterfinals on Wednesday with a 7:00 pm tip-off. Now officially playing with house money, the Knights are excited to see if their senior leadership from this thrilling win can carry over into a deep state tournament run.